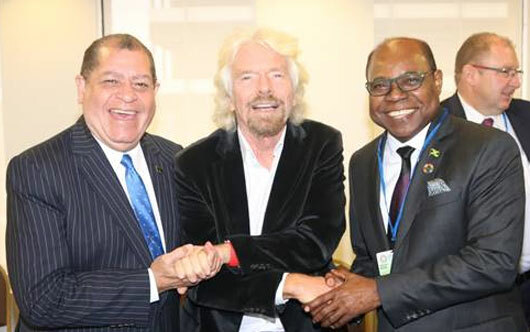 Sir Richard Branson (c), founder of the Virgin Group, greets Jamaica’s Minister of Finance and the Public Service, Audley Shaw (l) and Jamaica’s Minister of Tourism, Ed Bartlett (r), in Washington, D.C. The three were in Washington for the 2017 Annual Meetings of the World Bank Group and the International Monetary Fund, held Oct. 13-15. Bartlett’s meeting with Branson was timely, with Minister Bartlett’s appointment as the co-ordinator of the United Nations World Tourism Organization’s (UNWTO) Disaster Recovery Working Group for the Affected States in the Caribbean, and Branson’s role as co-founder of the Caribbean and International Partners Action Dialogue on Hurricanes. Bartlett also participated in a high-level, ministerial closed-door event titled Travel, Tourism, and Outbreaks – A Pandemic Simulation.